Royal Mail Group is delighted to announce the Stroke Association as its new charity partner for the next two years. The Stroke Association was chosen to be Royal Mail Group’s new Charity of the Year after around 40,000 employees selected it in a staff vote. The company aims to raise at least £2 million for the charity over the course of the partnership.Royal Mail will match every penny raised by colleagues, up to £1 million. Money raised will help the charity provide Life After Stroke grants of up to £300 to help 10,000 stroke survivors. The partnership will also aim to raise awareness of the condition as well as steps people can take to reduce their stroke risk. There are around 152,000 strokes in the UK every year and it is the leading cause of severe adult disability. There are over 1.2 million people in the UK living with the effects of stroke. Letters delivered across the UK from today (Monday 29th September2014) will be helping to raise awareness of Royal Mail Group’s charity partner, the Stroke Association. The postmark will be used frequently over the next two years. It will feature on millions of items of mail delivered nationwide by Royal Mail’s postmen and women. The earliest examples we have seen are dated 29 September but the wording of the press release suggests that postmarking started on Friday/Saturday 26/27 for delivery on Monday 29th. As usual the postmark is in two styles depending on the type of machine being used at the Mail Centres. Thanks to Bob for these images. Please send us examples from other locations, especially if they are with earlier dates. Readers will be reassured to know that dealers can get as confused as collectors, so forgive me if this is not news! and John (ATM Informer) McCallum has now confirmed that this is the first sighting of this stamp. The Post and Go machines at St Vincent Street Glasgow have recently been replaced by NCR Self-Service machines - indeed this may have been posted on the first day. In which case it may be a first day cover of the stamps as well, as the 2nd class Machin Faststamps have the MA14 year code. Thanks to the sender for getting the self-inking counter datestamp on these as the slogan doesn't really show the date of 22 September. Several collectors have remarked that so far 2014 has had no Generic Smilers Sheets and very few Commemorative Sheets. 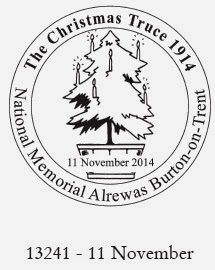 We can now complete the programme for the rest of the year - special postmarks (if any) for all sheets except Christmas will be shown here as they are announced. 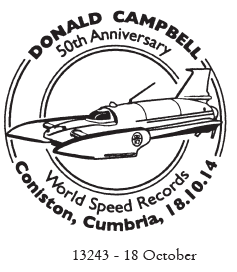 16 October 2014 Commemorative Sheet - Donald Campbell. 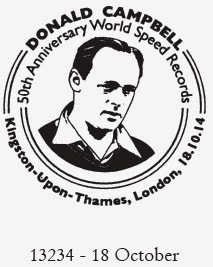 It is 50 years since Donald Campbell became the first person to set both water and land speed records in the same year. - Technical details of the Bluebird CN7 car and Bluebird K7 boat he developed with Leo Villa for his attempts on the Water Speed Record (WSR) and Land Speed Record (LSR). - A log of the speeds recorded for both the Bluebird CN7 and Bluebird K7 and where and when they were achieved. 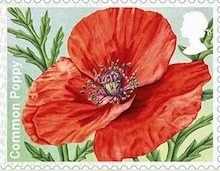 Two special postmarks have been produced in connection with this anniversary Commemorative Sheet. Postmarks are actually dated 16th October. 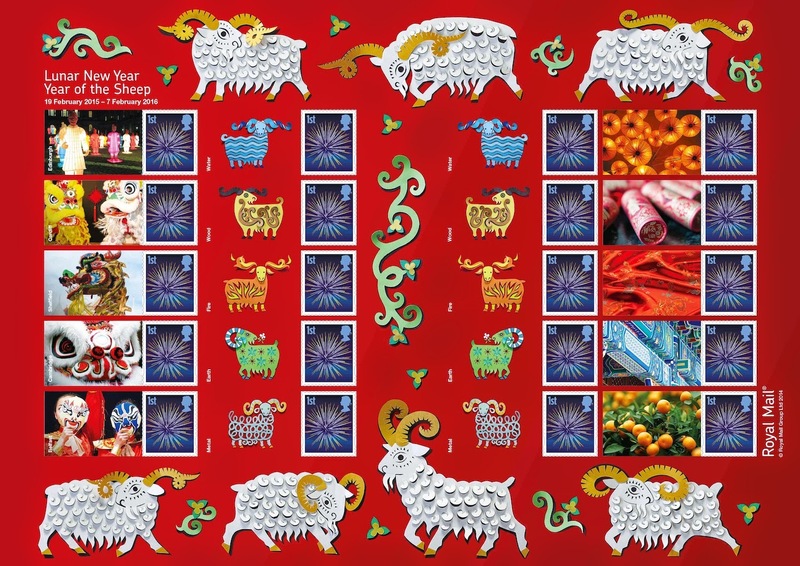 4 November 2014 Christmas Generic Sheet - postmarks for this issue will be on the website. The Christmas Truce is seen as a symbolic moment of peace and humanity amidst one of the most violent events in modern history. 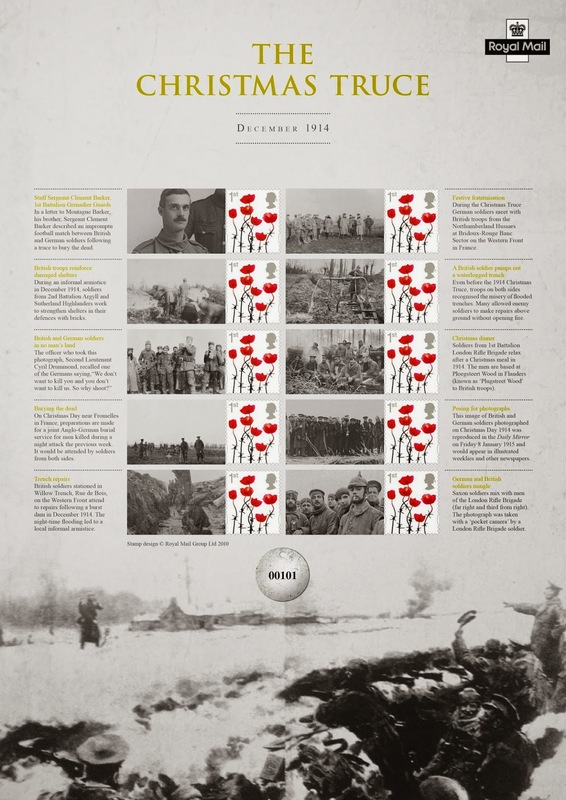 This Commemorative Sheet explores the events that led to the truce, the activities - decorating the trenches with candles, carol singing, exchanging of gifts and the games of football - supported by eyewitness accounts, from both sides, newspaper articles and artefacts. 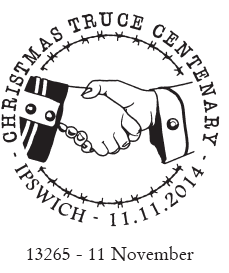 The 1914 Christmas Truce began on Christmas Eve along the British and German lines around Ypres, Belgium. The impulse to celebrate the holiday season has been traced to several theories. Among these was the fact that the war was only four months old and the level of animosity between the ranks was not as high as it would be later. This was complimented by sense of shared discomfort as the early trenches lacked amenities and were prone to flooding. Also, the landscape, aside from the newly dug trenches, still appeared relatively normal, with fields and intact villages all of which contributed to a degree of civilization to the proceedings. 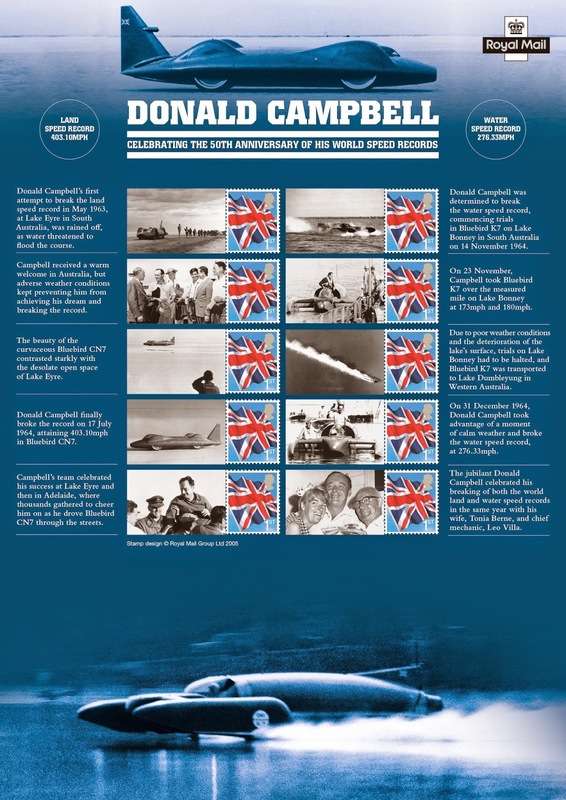 Special postmarks will be available on the day this anniversary Commemorative Sheet is issued. Ref 13241 will be available from the Midland SHC in Birmingham. 13265-7 will be in use at London SHC at Mount Pleasant. Please note these images are not to scale. 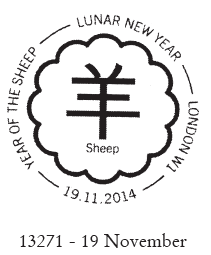 The postmark shown will be in use on 19 November at the London SHC, Mount Pleasant. 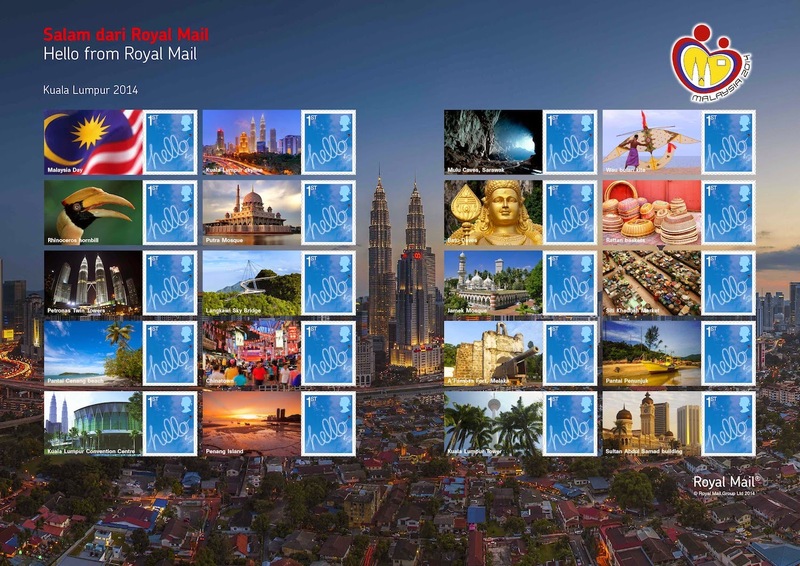 This will be the first time Malaysia will have hosted an FIP exhibition and to commemorate the show Royal Mail will issue an Exhibition Sheet on the opening day of show which runs from 1st to 6th December 2014 at Kuala Lumpur Convention Centre. The Exhibition Stamp Sheet will feature 20 iconic images relating to the country, including the Convention Centre in which the exhibition is being held, alongside 20 ‘Hello’ 1st Class stamps. From what I can make out this would have been applied from 9 September so as to appear on mail arriving from 10th, the day the games started. I've seen the first type also from Sheffield and SE Wales mail centres, and the second type also from Peterborough MC. 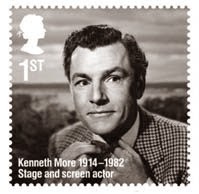 Today we received another postmark in the Remarkable Lives series for stage and screen actor Kenneth More who died in 1982. The postmark is intended to appear on mail delivered nationwide on Saturday 20th September, the date of Kenneth’s 100th birthday: the one we have is from Peterborough MC on 18th September. However, the nationwide application of this may be patchy as the same post brought this Postcode slogan from Gatwick MC also on 18th September. On the other hand, Swindon were using the slogan on Saturday 20th. Examples of Ryder Cup Gleneagles slogans have been added to the original post. This brief message (in black) is a prelude to what will be a more complete story on Friday after I have been to Stampex. Further news added below in blue. Today is the first day of issue of the Symbolic Flowers Post and Go Faststamps at Stampex and at Post Office Ltd branches nationwide. 1. 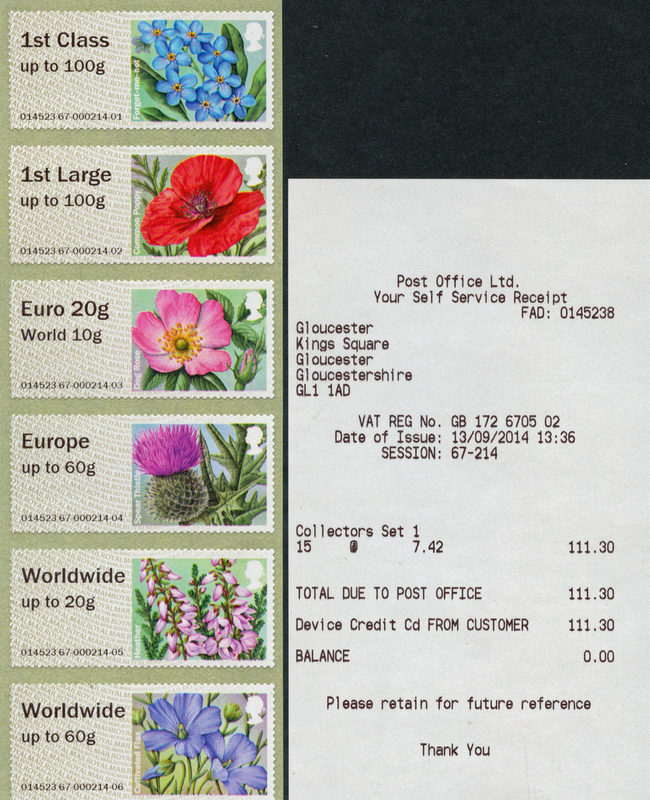 Some Post Office branches with Post and Go machines assert that they have not received the Symbolic Flowers stamps. 2. Some offices (with or without machines) have received the 'packs' of bureau-printed stamps. Apparently in all of West Sussex no branches have blank FDCs. In Leeds one branch had no stamps, the other had the stamps and the FDC, but with no inserts. 3. Gloucester PO was selling Symbolic Flowers from the NCR Post and Go machine on 13 September (see right, from eBay). 4. Leeds and Harrogate have the new stamps for their Wincor-Nixdorf machines. According to the Jersey Post Philatelic Website yesterday (16th) they were selling stamps from their bureau (produced by the back-office machine) with a Stampex Autumn 2014 inscription/overprint. Today the website has changed and no longer indicates what the overprint is. 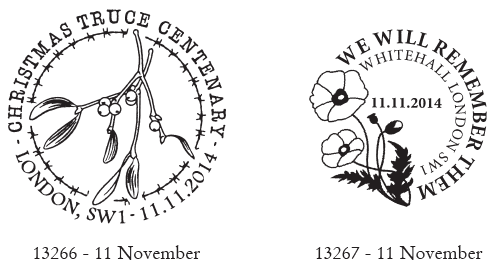 This is because when they received the stamps to sell the inscription read First World War Centenary. 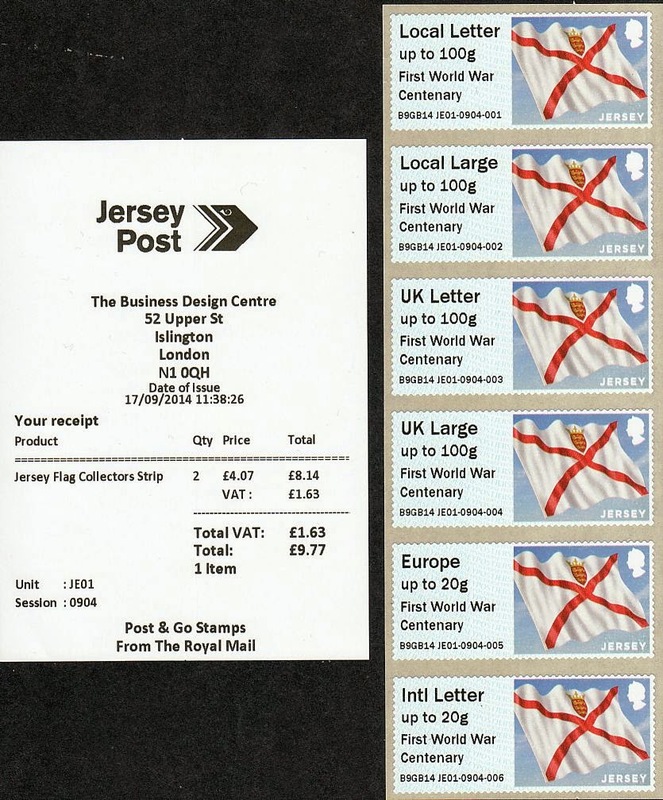 I asked the Jersey bureau if the Union Flag stamp from the JE01 machine would have the same inscription and the answer was an uncertain positive. When I pointed out that the Royal Mail machines selling the Union Flag would not have this inscription, that was changed to an uncertain negative. 1. 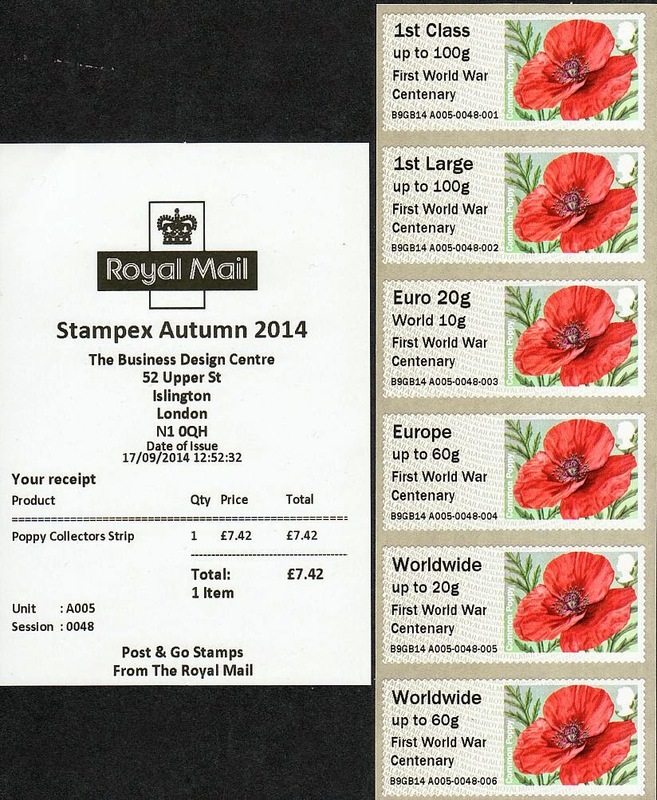 The Union Flag stamps sold from JE01 did not have the World War 1 inscription (as we suspected, really). 2. The Union Flag stamps that I have are all undated. 3. The Machin stamps from A3 and MA13 and those from B001 are undated. It was good to meet up with friends old and new yesterday: Thomas - ATM specialist from Germany, Chris, Tony, Vince, Bob, Graham (Smilers) Howard, Brian, Torsten Weller and Michael Eastick from Australia, and the Royal Mail team (sorry for anybody I've missed from that list). Plus Generic Smilers and Commemorative Sheets. Further details will be announced in due course. And lastly, Julia Lee leaves Stamp Magazine today for a new job outside philately. We've been blessed to have had her hand on the GB tiller at the mag for several years now, and on twitter and the SM forum. Good luck, Julia, and thanks ! Post and Go in central London - any Wincor-Nixdorf left? A correspondent has been looking at various blog posts about the change from Wincor-Nixdorf Post and Go machines to NCR Self Service in London, and can't find the answer to this question. Can anybody tell me whether there are any Wincors left - starting from Islington (Stampex) and working through the central London area?